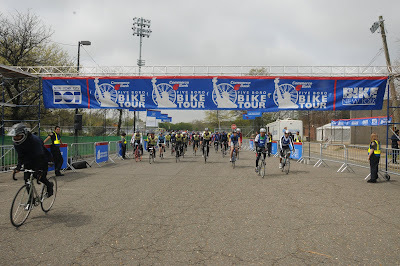 Found this interesting picture on a BikeSnobNYC blog post which appears to be the Tour of New York bike ride but if you look closely at the rider in the left foreground, it appears that he is wearing a full faced helmet? I thought that was only for huckling and buckling mountain bikers, or for those who don't know what going big means, kids that think they are invincible. 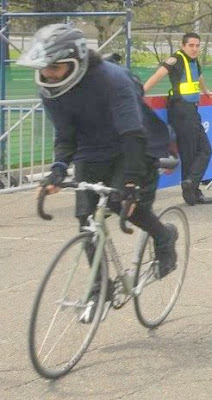 This guy looks like he is definitely riding a fixie, BikeSnob confirmed my guess that he is riding a Bianchi Pista and the bike looks like it only have a front brake. You would think people that ride the streets of New York might consider these helmets more but I think this is the first time I have seen one, granted I don't get to the city much and you rarely see fixie riders around here. Still, having a full faced helmet would be especially helpful in deflecting any face plants. I queried this on Google and came across an interesting video on a Bicycle Commuter's Blog. A full faced helmet would have saved this person's face for sure and maybe he would have stood a little chance with a regular helmet, too, but helmet's seem to be a rarity in general with all the cyclists in this video. Riding full faced on the road, especially in the summer would be pretty horrible. I don't know how the mountain bikers can take it. It makes sense, though. I think I will take my chances with a regular helmet.